Baldwin P. Leninforth, Ombudsman. 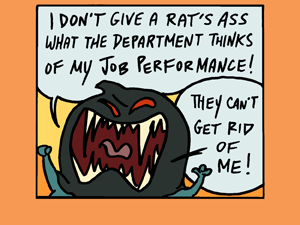 Mr. Leninforth is a mild-mannered, etiquette-focused, semi-aquatic mammal who mediates demon bureaucracy. Pictured below is the Underlord of Doomsmuir, one of the ombudsman’s clients in the current story arc, The Inventor.